March 23, 2018 Dan O. Who wouldn’t wanna sculpt and hang out with Armie Hammer? In Paris 1964, famed painter Alberto Giacometti (Geoffrey Rush) bumps into his old friend James Lord (Armie Hammer), an American critic, and for some reason, he is stunned by his features. So, he does what any curious artist would do and asks him to be a model for his latest portrait in his studio for a couple of days. Lord agrees, thinking that this isn’t just the opportunity of a lifetime, but that it probably won’t turn out to be all that long. After all, he’s got to get back to the states to his significant other, work, and general well-being. But eventually, the days turn into weeks, the weeks turn into months, and so on and so forth, and it isn’t before long that the two have become inseparable. Geoffrey Rush creepin’ on the ladies. Fact, or fiction? Final Portrait isn’t a very challenging movie. Writer/director Stanley Tucci keeps things small and sweet enough to where we enjoy the what we see, but we never really grab it by the horns and take it in – it’s all comfort-food, made for and by people who like that kind of stuff. 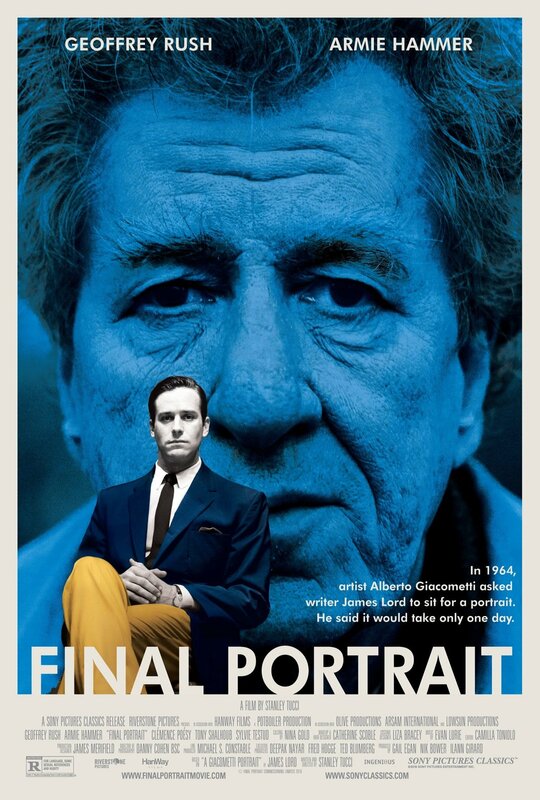 And in ways, there’s nothing wrong with that; Final Portrait is an inoffensive, rather simple movie about two artists who forge something of a friendship later in their lives and all of the highs and not-so lows that come from it. Whatever drew Tucci to this material doesn’t really show, except that he got a solid ensemble to help ensure not everything was too flighty, so it’s hard to really get mad at him for not going anywhere deeper or further out. In other words, Final Portrait is a mediocre movie. But it’s a mediocre movie that also features Geoffrey Rush and Armie Hammer in it the whole time, so really, what could be so wrong about that? Hammer’s not really stretching himself much here, but he’s bashful, charming and likable enough as Lord to be our conduit into this wacky and weird world of Paris art, and easily accessible enough to get out of the way of all the other shenanigans. Like shenanigans from the likes of Clémence Poésy, Sylvie Testud, an almost unrecognizable Tony Schaloub, and of course, Rush himself. If that’s the “artistic process”, then sure, go for it. As Giacometti, Rush really digs deep into what makes this artist tick, who he is, and why he is. He’s not an easy person to read, or even at times, like, but Rush has such a goodwill charm that’s hard to deny, even when it seems like he’s literally carrying the movie on his own lanky shoulders. And together, he and Hammer create something of a sweet chemistry, where one’s rather weird and idiosyncratic, and the other is just happy to be around for the party. What the two bring out in the other, isn’t ever really known or brought to our attention, but sometimes, it’s just nice to watch two actors genuinely enjoy each other’s company and that’s what we get with Rush and Hammer. Two guys who I never thought I’d see in a movie together. But hey, here they are and with Tucci behind the camera, of all people. What a time to be alive. What a time. Consensus: Featuring two charming performances in the leads, Final Portrait works as a bit of a sweet, entertaining and light escapism that we need so desperately, even when it’s as mediocre as this. The start of a very odd, very drunk, and very weird friendship. I haven’t seen the movie (and I want to), but I get the impression from your review that it is not designed to entertain under a mainstream definition. So I ask: is the focus of the movie on the artist and how he creates his work, concerning itself with details of painting, a specific style, etc. ?